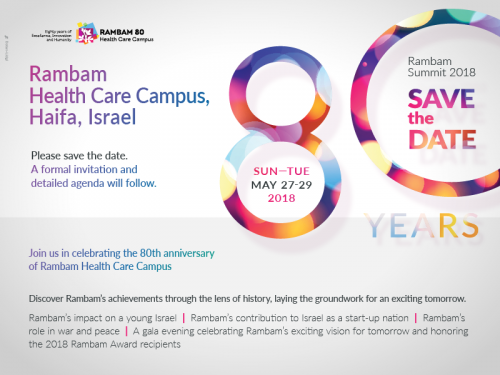 British Friends of Rambam is a national charity established to promote and support The Rambam Health Care Campus located in Haifa, Israel. Rambam aspires to lead in all aspects of medical care on behalf of the population in Haifa and northern Israel in times of peace and sadly war regardless of race or creed. Patients and medical staff are from diverse ethnic backgrounds including Jewish, Christian, Muslim and Druze. Erin’s Room – A room with a view! The Futuristic OR is Here! Rambam Health Care Campus is involved in its most extensive site improvement ever, designed to dramatically improve hospitalisation services and to transform Rambam into one of the most advanced medical centres in the world. The Paediatric Nephrology Centre at Rambam is the largest in Israel’s north and has achieved national and international recognition as a leading clinical, academic and research program. The Ruth Rappaport Children’s Hospital provides improved physical and social conditions commensurate with Rambam pediatricians’ delivery of the highest quality medical care to the approximately 600,000 youngsters. Setting up a regular donation is the most efficient way to donate, and helps us to plan ahead for key projects and expenditure. If you prefer to make a one-off donation, that would also be most welcome.